Mobile station is combination of user's all equipment (mobile phone, SIM, card etc.) and software needed for communication with a GSM network. Mobile station communicates the information with the user and modifies it to the transmission protocols of the air interface to communicate with the Base Station Subsystem (BSS). The information of the user communicates with the MS through a microphone and speaker for the speech, keyboard and display for short messaging and wire and cable connection for other data terminals. A Base station transmits and receives user data in the cellular network to customer phones and cellular devices. It is connected to an antenna (or multiple antennas). BS is a fixed point of communication for customer cellular phones on a carrier network. BSs (Base stations) are company specific. However one single site may host multiple base stations from competing telecommunication companies. It is a smart card which stores data for GSM cellular telephone subscriber. It is also called portable memory chip. Data stored by the SIM includes user identity, location and phone number, network authorization data, contact lists, personal security keys and stored text messages. Security features contains authentication and encryption to protect data and prevent eavesdropping. The BTS is used for data transmission between the mobile phone and the base station. It has a equipment for encryption and decryption of communications, spectrum filtering equipment, antenna and transceivers (TRX). It is a telephone exchange that is actually used to make the connection between mobile users within the network, from mobile users to the public switched network (PSTN) and from mobile users to other mobile networks. 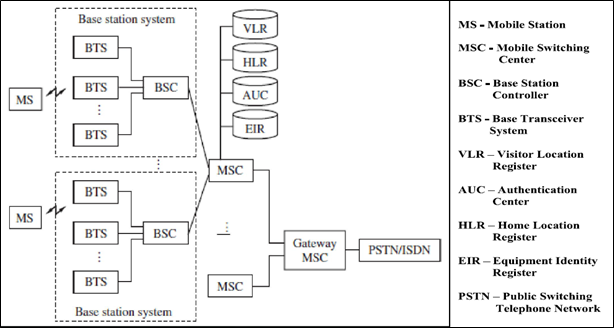 MSC is the hardware part of wireless switch. It also provides support for registration and maintenance of the connection with the mobile stations. BSC is used to control a group of Base Transceiver Stations. It is used for the allocation of radio resources to a mobile call and for the handovers that are made between base stations (BS) under their control. Other handovers are controlled by the MSC. Channel is a range of frequency allotted to particular service or systems. Carrier is a company to which your mobile device connects to, such as Idea, Airtel, BSNL, Vodafone etc. Transceiver is a device capable to perform simultaneously transmitting and receiving radio signals. It a network point that acts as an entrance to another network. GSM is called Global System for Mobile Communication. It is a standard to describe protocols for digital cellular networks used by mobile phones.